You are here: Home / Kitty Wisdom / Be a Red Carpet Kitty This Wednesday! Be a Red Carpet Kitty This Wednesday! As most of you probably know, the Academy Awards is being held this Sunday, February 26. But what some of you may not know is that the stars who attend get all sorts of awesome goodie bags full of cool stuff! And this year, my pal Gracie from The Tiniest Tiger will be handing out swag to celebrities — and to some of you lucky kitties! She and cat behaviorist Jackson Galaxy from My Cat From Hell will be at the Secret Room Events Backstage Luxury Lounge Wednesday night, handing out the brand new Tiniest Tiger Hipster Bag (filled with over $242 worth of products and coupons) to VIP celebrities… and maybe to you! 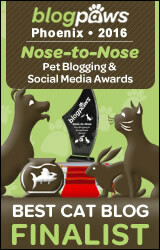 That’s because they will also be having a Red Carpet Cat Twitter Party! 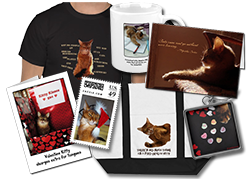 The #RedCarpetCat Twitter party is hosted by Event Barkers on Wednesday, February 22 from 5:30–7:00 PM Pacific Time, and they will be giving away over $2500 of prizes! Make sure you RSVP early — there will be special giveaways leading up to the party! As you know, I live right near Hollywood myself, so you may be wondering why I am not at this event in person? Well, you are not going to believe this but my human has a stupid, boring out-of-town family commitment the very day it is happening, and I am so mad at her for not changing it. Never mind that her commitment was made a couple of months in advance. Here is a once-in-a-lifetime opportunity and she has to spoil it. Even worse, her boyfriend will be home to feed me… and he always forgets to watch and lets Binga steal my dinner. But even though I will not be at the party, I am still part of the big event going on afterwards! It is a Red Carpet Cat Walk Blog Tour and many of the bloggers who donated items for the Tiniest Tiger Hipster Bag will be participating — and that includes me because each bag contains one of my awesome bookmarks (which include important Cat Rules for Humans). So I will have a blog post sometime in the next couple of weeks to give you a chance to win one of these cool, loaded bags! And yes, that means even if you live in Canada, the UK, Europe or Australia! So keep an eye out — it will be happening soon! We hope your food doesnt get stolen while your mom is gone! We think giving Binga a meaningful growl along with a raised paw would help save your dinner, Sparkle. If the Mistress of the Universe position is open, we think you should accept! Wow! Thanks for letting us know, it should be fun, can’t wait!! I’ll remember you that day and hope Binga doesn’t steal your dinner. Red carpets would be fun, but it could be very busy with all the people this way there is a quietier way to participate. Maybe Binga will even be nice and not steal food this time? We’re sorry you have to miss the red carpet, but the celebrities will be glad cause you would steal the show! Oh that is very cool Sparkle! That event and the swag sound great! How many weekends are there a year and THIS is the one your human picked to be out of town? Clearly humans have different priorities than we do. It’s pretty cool your bookmarks will be in the bags though! This sounds like a lot of fun, Sparkle! But more fun if you would be there! We’ll check it out!! Oh, Sparkle, darling, I am leaving the Master (Mistress) of the Universe spot open for **you**! Once again, a Human places their concerns before ours…she should be punished! Severely. This sounds so very exciting!!!! Humans can be a pain in the tail, can’t they? Whoa! I know Gracie on Twitter and never knew about this cool pawty. Thanks for spreading the word. You can always find me near the swag bag! Sparkle, mes thinks that yous would outshine all the actresses in their dresses with your gorgeous floof! They would knot like that and might be mean, so its a good thing that yous gets to stay home. I say the Oscar goes to…Sparkle!!! We think you should have been the guest of honour Sparkle. Humans can be sooo inconsiderate sometimes! Very cool, Sparkle! You are a celebrity yourself and belong on the red carpet. So you deserve a goody bag for sure.